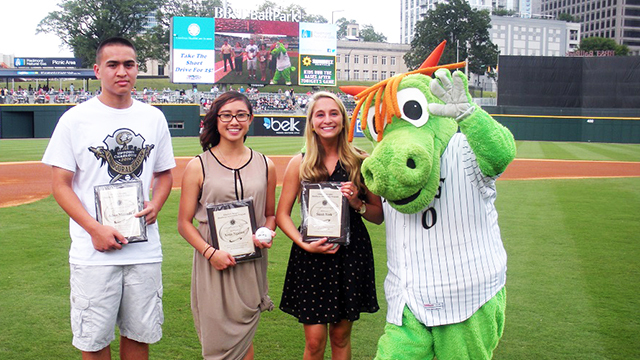 From L-R -- 2014 Charlotte Knights Healthcare Scholarship recipients: Adam Miranda (NC State), Xena Nguyen (UNC - Chapel Hill), Sarah York (Wake Forest) and Homer the Dragon. (UPTOWN CHARLOTTE, NC) - The Charlotte Knights are once again teaming up with two of their founding partners to provide educational funding through two unique scholarships for high school students. The Charlotte Knights Healthcare Scholarship, presented by Carolinas HealthCare System, along with the Charlotte Knights STEM Scholarship Program, presented by Piedmont Natural Gas, each represent the team's focus on community initiatives. "We are excited to once again team with Carolinas HealthCare System and Piedmont Natural Gas on these very important scholarships for local high school students," said Chris Semmens, Charlotte Knights vice president of sales. "Supporting education is one of our primary goals and we look forward to working with our founding partners to help local students prepare for successful careers." The Knights and Carolinas HealthCare System began their partnership in 2013 with the Charlotte Knights Healthcare Scholarship program. That season, the Knights honored high school students John Dock Tallent (Appalachian State University), Gisele Bailey (Harvard University) and Stephanie Smith (UNC - Chapel Hill) as the inaugural recipients of the Charlotte Knights Healthcare Scholarship program presented by Carolinas HealthCare System. Last season, three more high school students were awarded a $1,000 scholarship each -- Adam Miranda (NC State), Sarah York (Wake Forest), and Xena Nguyen (UNC - Chapel Hill). In an effort to improve educational funding for high school students who are interested in pursuing a career in health care, the Charlotte Knights and Carolinas HealthCare System will once again provide three $1,000 college scholarships to local high school seniors in 2015. "Carolinas HealthCare System's vision is to lead the transformation of health care delivery and a key part of that effort is attracting the next generation of motivated, creative health care professionals," said Carol Lovin, Executive Vice President of Carolinas HealthCare System. "Partnering with the Charlotte Knights to provide these scholarships is a great way to help turn that vision into reality." The Knights and Piedmont Natural Gas also will award three $1,000 college scholarships to high school seniors from the Charlotte region who plan to attend college and pursue studies in the STEM disciplines of science, technology, engineering or math. Last year, Piedmont and the Knights awarded three $1,000 scholarships to students attending college within Piedmont's service territories in North and South Carolina. The three winners of the inaugural scholarship were EmmaLee Apple (Alamance Community College), James Reynolds (Bob Jones University), and Cody Wright (Guilford Technical Community College). "STEM education is a focus area for Piedmont Natural Gas, and we are happy to join the Knights in offering these scholarships to students in the Charlotte region," said Timothy Greenhouse, managing director of community relations for Piedmont Natural Gas. "Piedmont will continue to support programs like this that expand educational opportunities in our communities." The Carolinas HealthCare System scholarships will be awarded during an on-field ceremony at BB&T Ballpark on Tuesday, July 21, while the Piedmont Natural Gas scholarships will be awarded during an on-field ceremony on Thursday, July 23. More details about each of the scholarships, along with applications to apply, guidelines and more, are now available at charlotteknights.com. All applications must be emailed to scholarships@charlotteknights.com or mailed to Charlotte Knights Annual Scholarship at 324 South Mint St., Charlotte, NC 28202. All applications must be postmarked by May 1, 2015. Carolinas HealthCare System (carolinashealthcare.org), one of the nation's leading and most innovative healthcare organizations, provides a full spectrum of healthcare and wellness programs throughout North and South Carolina. Its diverse network of nearly 800 care locations includes academic medical centers, hospitals, freestanding emergency departments, physician practices, surgical and rehabilitation centers, home health agencies, nursing homes and behavioral health centers, as well as hospice and palliative care services. CHS works to improve and enhance the overall health and wellbeing of its communities through high quality patient care, education and research programs, and numerous collaborative partnerships and initiatives. Piedmont Natural Gas is an energy services company primarily engaged in the distribution of natural gas to more than 1 million residential, commercial, industrial and power generation utility customers in portions of North Carolina, South Carolina and Tennessee, including customers served by municipalities who are wholesale customers. Our subsidiaries are invested in joint venture, energy-related businesses, including unregulated retail natural gas marketing, and regulated interstate natural gas transportation and storage, and regulated intrastate natural gas transportation businesses. More information about Piedmont Natural Gas is available on the Internet at www.piedmontng.com. The Charlotte Knights return home to BB&T Ballpark on Friday, April 3 as they host the Chicago White Sox in an exhibition game. Opening Knight of the 2015 season, which is the second for the Knights at BB&T Ballpark in Uptown Charlotte, is set for Thursday, April 9. Single-game tickets for all games at BB&T Ballpark in 2015 are on sale now and can be purchased online at charlotteknights.com, in person at the BB&T Ballpark Ticket Office, or by phone at 704-274-8282. Uptown Knights Are Better Than Ever!